There are a variety of Inks available on the market to suit various creative needs and requirements often determined by the intended application methods, the surface being worked upon, the desired results or the context in which the finished work is to be seen. The difference between different Inks is often defined by how the colour is produced and how the pure colour is fixed within the fluid solution. Inks are very versatile medium making them a popular choice amongst a wide range of creative’s including illustrators, designers and fine artists as well as crafters and decorative artists. 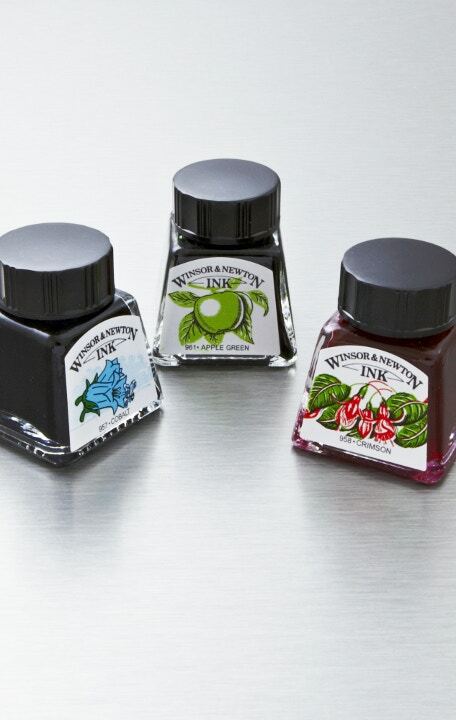 Dye based inks such as Winsor & Newton Drawing Inks are produced using a series of soluble dyes which are formulated within a shellac solution. Dye based inks are widely used by designers, calligraphers, illustrators and artists and are perfect for when the main requirement is the purest brilliance of colour. However, unlike paint, dye based colour has a lesser lightfast rating and so they are most suited to work being produced for portfolios, within sketchbooks or for digital imaging rather than for artworks produced for permanent display in prolonged or strong lighting conditions. Dye based inks are water–resistant (excludes Black Indian) and most suited for use upon paper, Bristol or illustration board and are ideal for use with dip pens and brushes. Acrylic Inks like Daler Rowney FW or Liquitex Inks are produced using pigmented colour, like paint, and are formulated for those who require a fluid, versatile colour, but also require the highest possible lightfastness. Compared to Dye based Inks, Acrylic inks perform with a very slight reduction in colour intensity, but with a much improved resistance to fading. Acrylic inks are waterproof and permanent upon drying and can also be fully intermixed with all forms of Acrylic paint and acrylic mediums making them even more versatile and appealing to artists. Acrylic inks are most suited for use upon paper, board and canvas, as well as a range of plastics, wood and ceramics and can be applied using a brush, dip pen and with technical pens or airbrushes.